Tags are what allows your signers to modify and add information to the document. Having a good understanding of what each tag does will help simplify the process when you create eSignature documents. To get started, here’s the list of tags that are available for use with Signority. We’ll go over each tag’s function, settings, and what it looks like on the user end. Signature tags allow recipients to add their signature to a document. 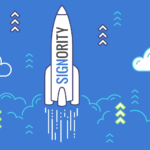 Signority allows for three signature methods by default – drawing a signature, typing a signature, and uploading a picture of a signature. 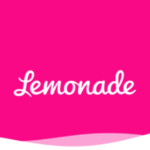 You can also create your default signature design for one click signings. There aren’t any settings other than whether to make a signature tag mandatory or optional by using the cogwheel when the tag is selected. When the document is sent out and the recipient is ready to sign, they need to click the signature tag. The signature window will appear and the signers have the option to Draw, Type, or Upload their signature. Click Apply when you’re happy with the signature to add it to the document. Initials Tags are often used on documents to prove that the signer has viewed and read a page (though Signority has other options for this use case). Initials function the same way as signatures. The settings are also the same, where you can change whether it is mandatory or optional. For the signers, they can click on it to bring up the signature window and you can Draw, Type, or Upload your initials, similar to how it works for the signature tags. Text tags allow your signers to input information into a document, such as their name, address, or email, for e.g. The settings for the text tags is fairly simple. You can make a tag optional or change the font size to match your document. For the signers, they simply need to click on the tag and begin typing to enter the appropriate information for the document. Use the Note tags to leave instructions on the document for individual signers. These can act like sticky notes for you to leave for your signers. You can assign them to specific signers so that they are visible only to that person. The settings for this tag is the same as for text tags, where you can change the font size, but there are no mandatory or optional settings for this tag. For the signers, they will see the same information you typed in and when the document is completed, the tag will disappear from the finalized document. The date tag is an easy way for your signers to date their signature or parts of the document. 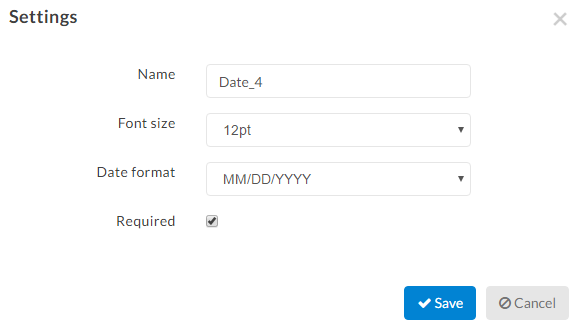 The default date format is MM/DD/YYYY. To change the date’s format, click on the date tag and then the settings cog that appears above. In the settings option, you can change the font sizing to match your document, as well as change the date format to one better suited for your document. Of course, you can also set the tag to optional. For the signers, the date tag is simple to use. Click it once to add the current date, and a second time to bring up a calendar to select a past or future date. Checkboxes are great for collecting multiple choice information from signers. This is great when the question allows signers to select more than one option. By default, checkboxes are optional, but you can set them to required. The checkbox settings are straight forward, you can select different styles of checks, between a checkmark, dot, and cross, for whatever your needs are. Just click on the settings cog when selecting a checkbox tag and bring up the settings window. Under Styles, select the most appropriate indicator and then click Save. When the signers are using checkboxes, the styles will be applied to the finalized document. The style will not be visible as the signer is using the checkbox on the signing page directly. The finalized PDF, however, will show the style you selected when preparing your document. Radio tags are useful when you have an either/or question, such as gender, education, etc. When you drag a radio button over, you’ll first be asked how many buttons will make up the group. The signer can only select one out of that grouping of radio tags. You can tell which radio tags are grouped together because the name of each tag will be the same. 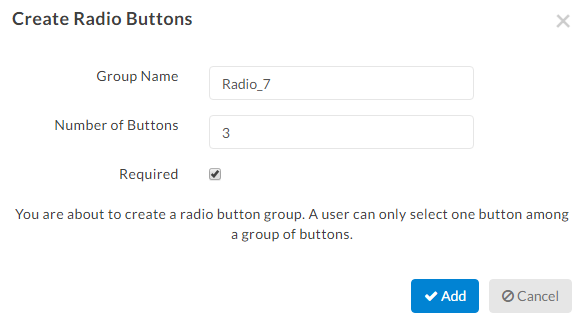 This means that if you entered the wrong number of buttons, you can add more by changing the names of the radio tags from the 2nd group to match the first. Because these radio tags are grouped together, when they’re mandatory, one of the tags in the group must be selected by the signer to satisfy those settings. For the signer, they simply need to click on the radio that is next to the best answer. 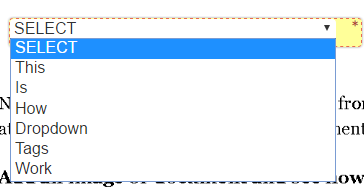 Dropdown menus allow a signer to choose one option from a list that you create. This is great for things like selecting which province or country someone is from, or which features or options are best for the signer, etc. 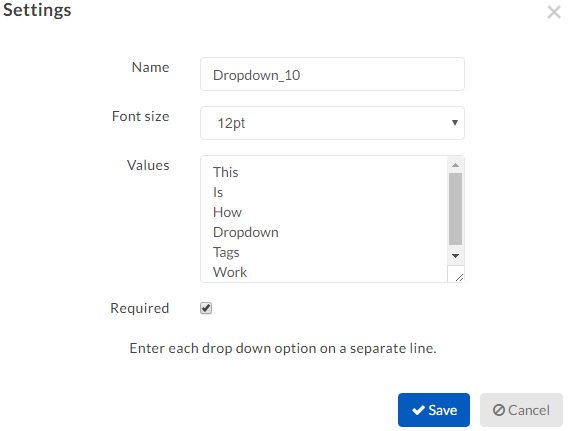 To set the options available in a dropdown, click on the tag in the document and then the settings cogwheel. Under the Values section, enter each option in separate lines, and each line will become a selectable option for your signers. You can also change the font size or make the tag optional as well. Once you’re done, click Save to continue. When the signers use the dropdown menu, they will see the options you designated and can then select the most appropriate one for the document. Attachment tags allow signers to upload and attach files to the document. This is really useful for accepting void cheques or bank statements, etc. A signer can only add one attachment per tag, so if you need multiple documents from them, multiple tags will be required. You can make them optional if you wish. For the signers, when they click the attachment tag, the Files window will pop up and allow you to upload a file from your computer. When the file is successfully attached, the paperclip will disappear and be replaced with a checkmark as seen below. All successfully attached files will be added as a new page at the very end of the document and will be included in the finalized document.